The ivans that surround the courtyard of Masjid-i-Jame in Isfahan consist of three Muqarnas, each giving different impressions. The southern Muqarnas, occupying a frontal position facing the courtyard, has an apex made up of 8 segments, suggesting a primitive strength. The western Muqarnas has a 5-segment apex, and displays an elegant form such as that seen in Hakuho sculptures. The eastern Muqarnas, with its 11-segmented apex, is complex and not aesthetically pleasing. It is not easy to discern the intention behind this contradistinction of three different impressions, with no unification of formative structures on these three sides of the courtyard. This mosque has been repeatedly rebuilt and modified over a very long span of time, from the year 960 in the early phase of Islam, to the time of the Mongol invasions in the 12th century. As a result, any attempt to date its construction has to answer a number of mysteries. To this end, the author has created exact drawings of many Muqarnas, classifying them into types in an attempt to clarify the formative styles of Muqarnas. The singular beauty of the Muqarnas, from which numerous concave hollows hang down in clusters (earning them the name, among Europeans, of stalactites or honeycombs), has been reported by travellers throughout history. Their descriptions, however, are little more than brief introductions, and many details remain unclear. In a paper published in the Tama Art University Bulletin in 1978, the author collected 450 examples of Muqarnas by adding the photographs listed in the reference bibliography to photographs taken while travelling in Turkey and Iran in January 1975, published the ceiling plans of 106 of these, and classified Muqarnas broadly into the square lattice pattern (which reached its peak in the 14th century) and the pole table pattern (which appeared in the 15th century and reached maturity in the 17th century). Besides this, the author also demonstrated that it is possible to clarify the genealogy of their respective geometrical plastic languages. By aligning these ceiling plans in a time-space matrix, we can broadly classify them into three different patterns. The three Muqarnas that surround the courtyard at Masjid-i-Jame in Isfahan, as mentioned above, are consistent with these three patterns. That is, the orderly, strong Muqarnas in the center of the square uses the original square lattice pattern that spread widely throughout the Islamic world, while the complex Muqarnas located on the eastern side is based on the pole table pattern, distributed in the eastern Islamic region. The elegant Muqarnas on the western side is neither the square nor the pole table type, but another pattern that developed to the west of Isfahan. A dome structure is utilized to construct the ceilings of the buildings using bricks. To place a circular brick dome on a square-plan building, squincharches need to be inserted into the four corners of the room, creating an octagonal shape that approximates a circle. As a way of aesthetically unifying the horizontal layers formed by the continuation of these squincharches, Muqarnas, which link a square room to a circular dome in this way, are thought to have developed from Persian brick architecture predating the Seljuk Empire. The wall patterns in 11th century Iranian tombs faithfully reproduce the image of decorated squincharches. The lower section of the wall patterns illustrates a square room and the upper part a circular dome, with a complex succession of small arches between the two. With the expansion of Islam, the square lattice pattern which fills ceiling plans with squares and 45 degree rhomboids spread throughout the entire Islamic region over the space of about 1,000 years. Muqarnas failed, however, to reach as far as India or Southeast Asia. Thereafter, the square lattice pattern came to be created freely as a surface decoration independent of the structure, and reached its peak in the Alhambra Palace, Granad. Surviving Muqarnas demonstrate a variety of construction methods and finishes, using materials produced locally in their respective areas. In Iran, the material used is brick, in Turkey it is stone, and on the Iberian peninsula, Sicily and northern Africa it is wood. The use of wood or stone makes it possible to form protrusions that hang down like stalactites. The style of square Muqarnas is a nonperiodic tiling tessellation that have a fourfold rotational symmetry. But AgzikaraHan(1240) have a fivefold rotational symmetry !! After the invasion and fall of the Mongols, the pole table pattern appeared during the Timurid dynasty in the 15th century, and became widespread in the Near and Middle East. The pole table pattern Muqarnas is an assembly of surface-decorated panels with no direct connection to the architectural structure. The panel components of the Muqarnas are first produced accurately on the ground using jigs, before being assembled and fixed to the architectural structure by means of attachment ribs protruding from it. Western travellers, on seeing these internal attachment ribs exposed after the surface panels had fallen away, called the Muqarnas ﾒhoneycombsﾓ. The apex of the pole table evolved from the original 4, 5 and 6 segments to 7 and 11 segments. To complete the puzzle of geometric patterns, star-shaped planes are inserted in a complex pattern at the concentric circle co-ordinates. The star shapes consist not only of 4, 5, 6 and 8 point stars, but also of 7 and 9 point stars, among others. 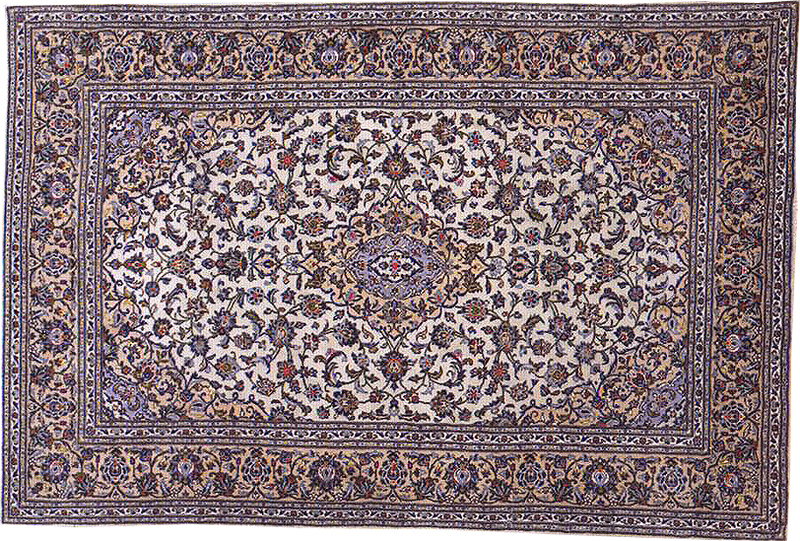 The pole table pattern reached perfection in the Shah Mosque at Isfahan during the Safavid dynasty. With the modernization of Islamic society thereafter, the traditional Muqarnas culture was abandoned, and the tide turned more towards overpowering and excessive architectural decoration that made plentiful use of mirrors and the like. The materials used include plaster stucco, mosaic panels, ceramic plates and stone. In Turkey, Syria and Egypt (sources of good quality stone), stone materials with few formational restrictions are used, leading to the creation and evolution of original Muqarnas styles. Patterns liberated from the constraints of the square lattice and pole table enjoyed limited distribution in stone-producing areas, and are notable for the originality of their designers. During the Osman period of Turkish history, "the Great Architect Sinan" created some unique Muqarnas. In Syria and Cairo, meanwhile, non-geometrical Muqarnas were also created. Although a certain symmetry that fills the surface planes is also possible with the triangular lattice, the pattern has to be made consistent in order to fill a square plan. In the modern era, Antonio Gaudi has created some unique Muqarnas. The high plains of Iran are a wild, arid region. Beautiful Persian carpets are created by taking the wool of sheep that flock here in search of the meagre resources of grass, spinning it and tying each strand in the warp. While the phrase ﾒArabesque patternsﾓ conjures up images of over-elaborate, tasteless ornamentation, the world of delicate symmetry seen in the vast emptiness of the desert has a surprisingly serene tranquillity. As we approach a village, our eye is first struck by the minarets of Islamic mosques receiving the full light of the sun, making them stand out like mirages. But as we near the delicate wall patterns, which look very much like woven lacework, we realize that what had looked like gorgeous patterns are nothing but unevenness on the walls formed by piling up humble sun-dried bricks. Formless mud, blown up by the wind, is kneaded with oasis water then hardened into fixed shapes, and finally dried in the fierce desert sun. The Persian brick arch creates a world of crystalline symmetry by assembling these brick unit elements in large quantities. 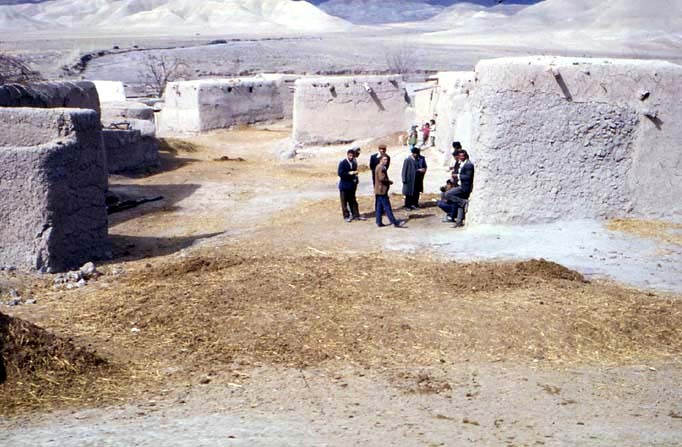 When a villageﾕs water dries up, its sun-dried brick buildings crumble, turning once again to soil that blows in the wind. At the Masjid-i-Jame in Isfahan, we can see a variety of geometrical patterns on the ancient brick-assembled dome and walls. These surface patterns are not decoration superimposed on the architectural surfaces, but patterns formed by the surface of walls in the process of gradually piling up structural brick units from below in a regular sequence. The appearance of the various patterns reveals differences in their respective construction processes. Similar examples of geometrical modelling principles arising from the properties of materials used can be seen in East Asian bamboo craft. In 2002, traces of what is thought to be man's oldest piece of handiwork, dating back 77,000 years, were found in the Blombos Cave in South Africa. The three groups of parallel lines carved into the ochre stone are reminiscent of bamboo craft. Although ancient examples of bamboo craft have disappeared owing to natural decomposition, there is no doubt that bamboo craft has been used for various purposes since primeval times. The Blombos Cave engraving dates from the earliest time in the existence of modern humans. From the very first emergence of homo sapiens, then, it is clear that an aesthetic awareness based on mathematical principles lay hidden in manﾕs genes. While bamboo craft creates flat surfaces of four-mesh latticework through intersections of straight lines, these can be transformed into curved surfaces using distortion towards the bias. And if diagonal elements are inserted into the four-mesh lattice, a six-mesh lattice is formed, and the structure becomes fixed. Moreover, whether four-mesh lattice or six-mesh lattice, if one mesh element is omitted to make three or five mesh, a non-Euclidean three-dimensional structure can be developed from this part. This characteristic of bamboo craft was reportedly used as reference when generating highly intricate three-dimensional molecular structures in modern nanotechnology. The Muqarnas consists of several horizontal layers lain one upon the other. Since the contour lines formed by each layer do not overlap each other, a Muqarnas can be expressed in a single ceiling plan, however complex it may be. That is, the empty space created by Muqarnas, like a cup cake in a metal mould, could be removed perpendicularly downwards without being trapped. This is the decisive characteristic of the Muqarnas, and is thought to carry great aesthetic, structural, and constructional significance. The 13th century design drawings inscribed on brick tablets that were discovered in the outskirts of Teheran, and the Muqarnas scrolls painted at the beginning of the 16th century (now kept in the Topkapi Palace Museum), can both be understood as ceiling plans. While the dome sections of the Masjid-i-Jame in Isfahan are decorated on the principle of non-Euclidean spherical geometry, the Muqarnas sections have a corbel structure rooted in plane geometry. Amazingly, the only tool used when building a brick dome is a single line of string. For brick construction, the string is tied to the wrist of the hand that holds the brick, and the other end of the string is fastened to the centre of the dome. This makes it possible to build up curved surfaces in true spherical form. Thin bricks are easily pasted onto the sloping surface, and are instantly dried and hardened by the sunﾕs heat. While Buckminster Fullerﾕs geodesic domes may be perceived as contemporary Muqarnas, they could be seen as designs for a world with no concept of gravity, since a truly round structure does not rationally resolve the impact of the earthﾕs gravity. Conversely, the design of the parabolic dome pursued by Antonio Gaudi does accurately calculate the earthﾕs gravity, but one feels that its form exceeds the range of human sympathies. On this point, the horseshoe arches of Islam succeed in creating a stable visual form. The shape of the Muqarnas, in which large numbers of horizontal layers gradually move in towards each other from the bottom, allays fears of collapse due to the earthﾕs gravity. 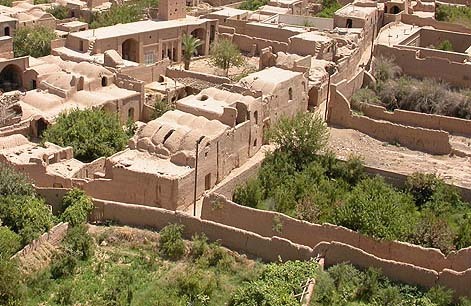 People in arid regions live their lives surrounded by the earthen walls of the oasis, into which water is led from the foothills of far-off snowy mountains via qanat (underground canals). Beyond the enclosure is a meaningless world where plants cannot grow. The word paradise derives from Old Persian pairidaeza, meaning a walled garden or enclosure (Faradis). If we compare the gorgeous finish of the architectural walls facing into Shah Square in Isfahan, as against the crude finish given to the outside, we may well understand the indifference to exteriors in Persian architecture. Even in ordinary homes, one is amazed at the splendour of interiors compared to the rough earth exteriors. In Iraq mausoleum architecture, similarly, exteriors invariably have the appearance of shoddy, incomplete architecture, giving a sensation of oddness. This severance of the interior from the exterior world may well express a sense of impermanence among desert peoples. The Muqarnas is a form of negative plastic art that has blossomed in interior architectural spaces. It could be seen as the complete reverse of the concept of western sculpture, in which hardened clay is formed under the heat of the sun. It would be inappropriate to reproduce these negative space formations of Muqarnas using the shade and shadow expressions of ordinary painting techniques. If expressed using computer graphic shading software, we would be left with nothing but a very vague formal expression. Normally, we understand forms depicted in paintings with a common perception of the way objects look under sunlight. When showing an object illuminated by an artificial light source in an indoor space, it is difficult to accurately express the form of the object unless the relationship between the light source and the object is shown in the same picture. Line drawings, however, are not troubled by the quality or patterns of surface reflection, and the formal structure can be shown abstractly, since the medium of shadow needed for the human perception of vision does not have to be used. In research on methods of perspective drawing during the Renaissance, supporting lines were exclusively used to elucidate formal structures. This is also why, when drawing sketches, outlines are drawn before shading (tone, valeur). Line drawings are suited to the expression of Muqarnas as negative shapes. However, since ceiling plans cannot express vertical relationships in a perpendicular direction, a different method has to be used to indicate the vertical relationships between contour lines. In the case of the inconsistent Muqarnas on the eastern side of Masjid-i-Jame in Isfahan, as mentioned earlier, old photographs reveal that it was previously in a state of collapse, and has been restored in the modern era. In recent years, partly for purposes of tourism, restoration work on Muqarnas has been carried out in various places. In this, it is surely necessary to understand the formative principles of Muqarnas and to attempt to restore them as original. In contrast to Moses, who is supposed to have received instruction from his god on the top of a mountain, Mohammedﾕs enlightenment took place inside a cave. The sense of mathematical symmetry in Islamic art has an other-worldly beauty that is quite at odds with the artistic sensibilities of Christian art. The focus of modern art history is on western Christian art, which continues the traditions of Greek and Roman real-life, figurative art. However, Islamic art, with its abstract, mathematical formations, has a fresh attraction that is more akin to contemporary computer art and various forms of experimental environmental art. As it becomes clear that human genes are formed from the mathematical sequences of the genome, the mechanical functions that we abhor are starting to be seen as an aspect of human nature. It would appear that human beings have yearned for freedom of expression in art because they dislike their own essence, which is mechanical. 1973 "Charter of Tama Institute of Art Design"
1973 "Statement of the Purpose and Aims of the Tama Institute of Art Dezign"